Throughout the school year, Bishop Chatard offers athletic and enrichment camps and clinics to grade-school and middle-school students. Half and full-day camps are available, or your child may bring a lunch and experience different camps in our morning and afternoon sessions. Early-bird and multiple-camp discounts are available on many camps. Plan to register early – many camps reach capacity quickly! 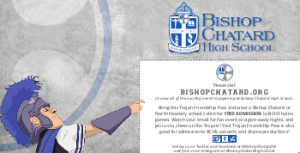 All North Deanery students receive the 2017/2018 Bishop Chatard Future Trojan Pass, providing free admittance to Bishop Chatard drama productions, concerts and home athletic events at the North Deanery high school! (Details are printed on the pass.) The passes are distributed by each North Deanery School. For details, or if you need to obtain a Future Trojan pass, contact Kelly Lucas, Director of Marketing and Communications, at klucas@bishopchatard.org. Visit Athletics to view the sports schedules. Visit Theatre for performance information. Visit Band & Choir for concert information.